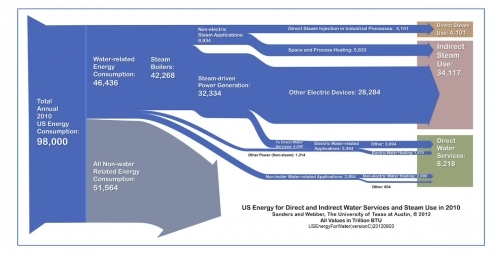 David Wogan at the Scientific American blogs that “Over 12 percent of all U.S. energy consumption is directly related to water”. This was identified in a 2012 study by researchers of UT Austin. The values in this Sankey diagram are for 2010 in trillion BTU. Energy is used for direct and indirect water services such as steam generation.